Malaysia Airlines (MAS) is cutting international seat capacity by about 18% in Aug-2015 as the ailing flag carrier restructures its network ahead of the 1-Sep-2015 transition to a new company. International ASKs are being reduced by about 23% as the medium and long haul networks have seen bigger reductions than operations within Asia with the new MAS seeking to leverage its strong regional position. Australia accounts for about 30% the seats and about 40% of the ASKs being removed from the MAS international network in Aug-2015. Europe accounts for about 10% of the seats and 20% of the ASKs being removed in Aug-2015 but the cuts to Europe are much steeper when also factoring in the May-2015 suspension of services to Frankfurt. In Sep-2015 MAS will for the first time have a fewer international ASKs than the AirAsia/AirAsia X groups. AirAsia’s short-haul Malaysian subsidiary will also overtake MAS as Malaysia’s largest international carrier on a seat basis. On a group level AirAsia already has more international seats in Malaysia and has been the domestic leader for several years. This is Part 2 in a series of reports on the upcoming capacity cuts at MAS and the impact on the Malaysian and broader Asian markets. The first report focused on Australia, where MAS is cutting seat capacity and ASKs by about 42% in Aug-2015 as it reduces its Australia schedule from 73 to 43 weekly flights. This report will focus on the overall restructuring of the MAS international network. While Australia and Europe are seeing the largest cuts, MAS is also cutting capacity in Aug-2015 to every sub-region of Asia – South Asia, North Asia and to a lesser extent regionally within Southeast Asia. The MAS Group currently has 307,000 international weekly seats, based on schedules for the week commencing 26-Jul-2015. 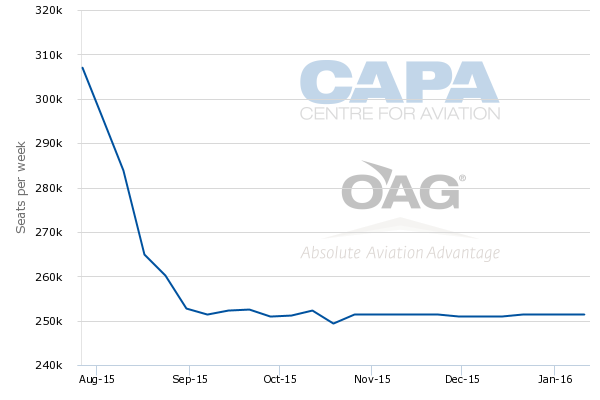 International seat capacity will drop 18% to about 252,000 international seats at the beginning of Sep-2015, according to CAPA and OAG data. Schedules for the next six months indicate that the group will maintain international capacity at approximately this level for at least the remainder of 2015. The 252,000 weekly international seats include about 238,000 seats at MAS mainline and about 14,000 seats at its regional subsidiary Firefly, which only operates turboprops. Firefly is mainly a domestic carrier but has a small international operation to neighbouring Southeast Asian countries which will not see any reductions as MAS mainline cuts back by about 19% from 293,000 international seats currently to 238,000 seats by the end of Aug-2015. On an ASK basis, the group is cutting capacity by 23% from about 1.045 billion weekly international ASKs currently to about 808 million weekly ASKs in early Sep-2015. Firefly only accounts for about 5 million of these ASKs with the remainder flown by MAS mainline. Current schedules show a slight increase in MAS international ASK levels to about 820 million from the end of Oct-2015, which marks the start of the northern winter season. This is driven by adjustments on Kuala Lumpur-Jeddah, a highly seasonal route which is being reduced to two weekly flight from mid-August-2015 to late October-2015 but will be back to daily from late Oct-2015. Based on the 820 million figure, international ASKs will be cut by 22% compared to current levels. With the upcoming cuts, the MAS group's share of seats in the Malaysian international market will slip from about 27% currently to 23% at the beginning of Sep-2015, when the new company takes over. The share of the AirAsia and AirAsia X groups combined will increase from about 41% currently to 43% at the beginning of Sep-2015, even despite a slight reduction in capacity. AirAsia/AirAsia X is already a larger player than MAS in the Malaysian international market at a group level based on current seat capacity. But MAS is currently the largest single international carrier. MAS will lose this distinction to AirAsia Group short-haul subsidiary Malaysia AirAsia following the upcoming 18% reduction in seat capacity. Meanwhile the MAS group's share of international ASKs will slip from about 34% currently to 29% at the beginning of Sep-2015. AirAsia/AirAsia X will overtake MAS in this category as its combined share of international ASKs increase from 32% to 34% despite a decrease in capacity. MAS will still be the largest single carrier in the Malaysian international market but from Sep-2015 it will have fewer ASKs than AirAsia and AirAsia X combined. The two AirAsia-branded Malaysian carriers will account for 30% of international ASKs in Sep-2015, compared to 29% for MAS, while AirAsia affiliates based overseas will account for another 3% of international ASKs in the Malaysian market, giving the AirAsia/AirAsia X groups the combined tally of 34%. MAS has been in restructuring mode since late Aug-2015, when government investment firm Khazanah unveiled a turnaround plan for the ailing flag carrier. But as CAPA previously highlighted, MAS was initially extremely slow in proceeding with the restructuring including implementing capacity cuts. Capacity levels were not reduced at all over the last four months of 2014 and the first four months of 2015, providing a frustrating situation for AirAsia and other competitors as the Malaysian market has continued to suffer from overcapacity. MAS finally began to implement some international cuts in 2Q2015 with the suspension of four routes. MAS dropped Kunming in China on 30-Apr-2015, Krabi in Thailand on 6-May-2015, Frankfurt in Germany on 29-May-2015 and Kochi in India on 1-Jun-2015. But these cuts removed only about 11,000 weekly seats, representing 3% to 4% of the group’s total international seat capacity. The MAS group offered about 320,000 weekly international seats in Apr-2015 – the last month before the initial four destinations were dropped – compared to the current capacity level of about 307,000 weekly seats. The MAS Group maintained about 320,000 international seats from Dec-2014 through the first four months of 2015, according to CAPA and OAG data. The group’s international capacity level was about 305,000 weekly seats in the same five-month period of 2013 and 2014 and was slightly lower from May-2014 through Nov-2014, which is generally considered an off-peak period in the Malaysian market. On a year-over-year basis, MAS Group international seat capacity will be down by about 16% or 46,000 weekly seats in Sep-2015 compared to Sep-2014. About 25% of this reduction was driven by the suspension of the four routes in 2Q2015 while the remaining 75% will be driven by reductions which are implemented in Aug-2015. Australia accounts for 37% of these cuts while Europe accounts for about 16%. The reductions being implemented in Aug-2015 are critical as they come just prior to the launch of a new company, MAS Bhd, on 1-Sep-2015. The new leaner and more efficient company will have about 14,000 employees compared to the 20,000 employees under the old company, which is continuing to operate through 31-Aug-2015. A controversial restructuring act that was passed by the Malaysian parliament in late 2014 also has given MAS the ability to cancel or renegotiate aircraft leases and about 4,000 contracts with other suppliers. This has provided MAS a benefit during the current transition period to the new company similar to what US carriers enjoy under Chapter 11 bankruptcy protection. The new leaner and more efficient company, led by new CEO Christoph Mueller, is expected to be profitable by 2018. The new MAS will have an international network of 47 passenger destinations, down from 50 currently and 53 in Apr-2015. The group had 53 international destinations prior the suspension of Kochi, Kunming and Frankfurt. Krabi is still served by Firefly so remains part of the group’s network. Firefly currently has seven international destinations but three of these are also served by MAS mainline, according to OAG data. MAS mainline currently has 46 international destinations, including 40 in Asia-Pacific, four in Europe and two in the Middle East. Three of these destinations, including one in Europe, are being suspended in Aug-2015. Destinations being suspended as part of the upcoming Aug-2015 cuts include Brisbane, Istanbul and Male, bringing the group total to 47 international destinations. MAS is also cutting capacity to more than one third of its remaining international destinations including Adelaide, Bali, Delhi, Guangzhou, Hong Kong, Jakarta, Manila, Medan, Melbourne, Mumbai, Paris, Perth, Shanghai, Sydney, Tokyo Narita and Yangon. 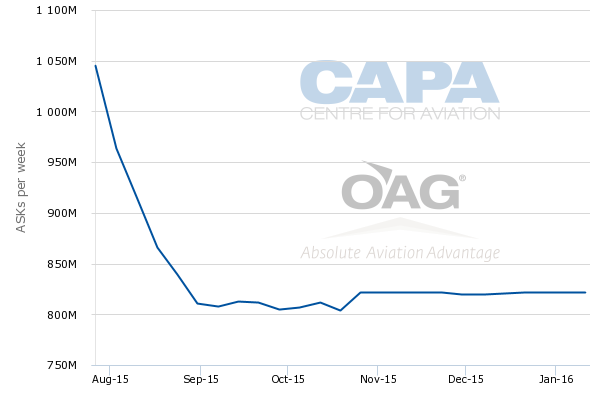 Over the next month seat capacity is being reduced by about 38% to the Southwest Pacific region, 26% to North Asia, 18% to Europe, 14% to South Asia and 9% to Southeast Asia, according to CAPA and OAG data. The Middle East is seeing a 25% reduction but this is temporary as Jeddah is cut seasonally to two weekly flights from mid Aug-2015 to late Oct-2015. Every region is also to have a double digit reduction in ASKs, led again by Southwest Pacific with a 36% decline. Southwest Pacific will only account for 21% of total international ASKs at the group in Sep-2015 compared to 26% currently. Europe is seeing a slight increase in ASK share over the next month to about 28% as the average system-wide cut in ASKs in Aug-2015 exceeds the reduction in Europe. But prior to the suspension of Frankfurt in May-2015 Europe accounted for about 30% of the group's international ASKs. Europe accounts for only about 10% of the seats being removed in Aug-2015 but again this does not include the May-2015 suspension of Frankfurt, which was served daily with 777-200s. The suspension of Frankfurt and Istanbul leaves MAS with only three European destinations – Amsterdam (daily), London Heathrow (double daily) and Paris (daily). Amsterdam is now served with 777s while both Heathrow flights and Paris are served with A380s. But Paris is being down-guaged in Aug-2015 from A380s to 777s as the MAS A380 fleet is reduced from six to four aircraft. The Paris changes along with the suspension of the thrice weekly 777 service to Istanbul drives the 18% reduction in seat capacity to Europe. MAS capacity to Europe will be down by about 26% or 7,500 weekly seats in Sep-2015 compared to Sep-2014, according to CAPA and OAG data. This reduction also takes into account Frankfurt. Europe accounts for about 16% of the seats that have been removed from the MAS international network over the last year. Europe accounts for a much higher portion of the ASK reduction, given that MAS does not have any other long haul destinations. MAS dropped Los Angeles, its only North American destination, in Apr-2014. Buenos Aires, Cape Town, Johannesburg and Rome were dropped in early 2012 during a previous network restructuring exercise. MAS resumed international expansion later in 2012 and accelerated expansion in 2013 and early 2014. While the group's international seat capacity will be down 16% year over year in Sep-2015, its international seat capacity will still be up by about 5% compared to Sep-2011 and Sep-2012 levels. International capacity within Southeast Asia will be up 34% in Sep-2015 compared to Sep-2011 levels. While MAS is cutting regional international capacity in Aug-2015 this only offsets increases that have been pursued since late 2014. Even with the upcoming reductions MAS group international capacity within Southeast Asia will be at a similar level in Sep-2015 as Sep-2014. MAS capacity to every other major region will be down in Sep-2015 compared to both Sep-2014 and Sep-2011. Middle East is an exception but MAS has a limited presence in the Middle East with service only to Dubai and Jeddah. Dubai was suspended in early 2012 as part of the last restructuring but reinstated in 2013 and has so far survived the current restructuring initiative. The emphasis on Southeast Asia is an important component of the MAS recovery plan. As CAPA highlighted after the recovery plan was initially unveiled in late Aug-2014, MAS is aiming to expand its presence regionally while improve its competitiveness through cost reductions that are aimed at closing the gap with LCCs. MAS is making some adjustments on short haul routes. But generally the cuts on short haul routes are relatively small reductions, in large markets where there will still be sufficient frequency for local business traffic and connections to the rest of the network. MAS will also still be able to offer sufficient regional connections to partners and continue to leverage its role as the only oneworld member from Southeast Asia. For example there will still be seven daily flights to Jakarta (down from eight), three daily flights to Manila (down from four), two daily flights to Medan (down from three) and 11 weekly flights to Yangon (down from 14). The other Asian destinations seeing capacity cuts are generally driven by down-gauging some flights from widebody to narrowbody aircraft rather than frequency adjustments. The Asian destinations that have been or are being dropped entirely are smaller secondary destinations which had limited business demand and were are not strategically important. Competition is intense in Malaysia’s short-haul international market as it is also the largest focus of AirAsia. But MAS strategically needs to maintain a large presence regionally as it is keen to benefit more from its membership in oneworld, which it joined in early 2013. MAS still does not codeshare on its regional routes with several oneworld carriers serving Kuala Lumpur including British Airways and Qatar Airways. The cuts to the medium-haul and long-haul network leave a potential opportunity for competitors, including AirAsia X. MAS needs to try to fill some of the holes created from these reductions by forging new or expanded partnerships. The capacity cuts are a recognition that MAS has to be smaller and smarter to survive. But completing the restructuring and successfully turning around the airline will not be an easy task. The capacity reductions and transition to a new company represents only the first chapter in a still unfolding story.